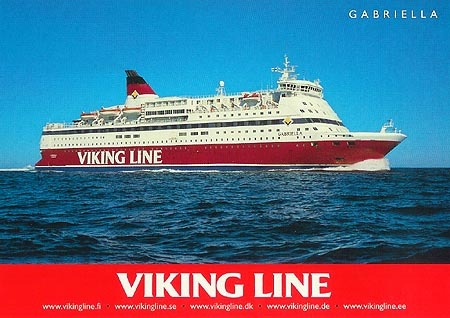 This page is devoted to postcards and photographs of the Viking Line ferry Gabriella. Frans Suell was built by Brodogradiliste Split, Croatia. 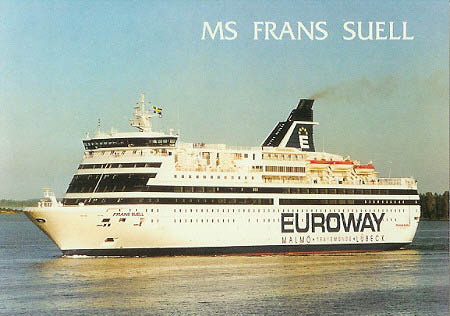 Frans Suell entered service in May 1992 on the Euroway service between Malmö-Travemünde/Lübeck. 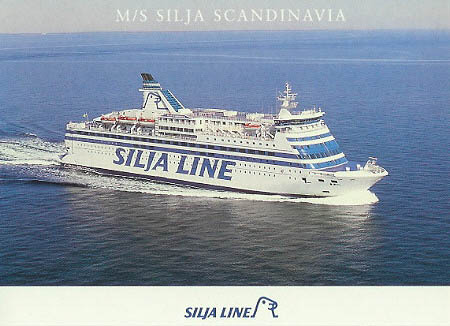 In 1993, the route changed to Copenhagen-Malmö-Travemünde-Lübeck, and marketing was undertaken by Silja Line, who provided their Silja Festival to run in partnership. 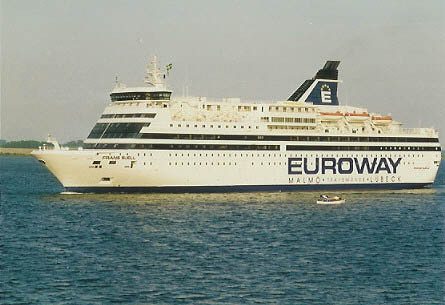 The Euroway service was closed in March 1994, and Frans Suell was chartered to Silja Line for service between Stockholm-Mariehamn-Turku/Åbo as the Silja Scandinavia. 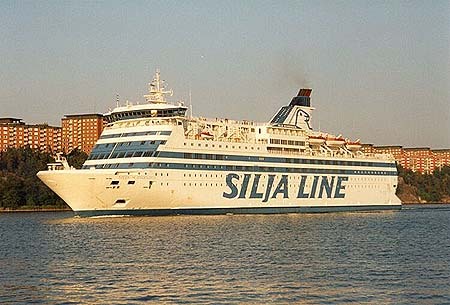 In 1996, Silja Scandinavia was sold to Viking Line for delivery in April 1997, joining sisterships Amorella and Isabella. 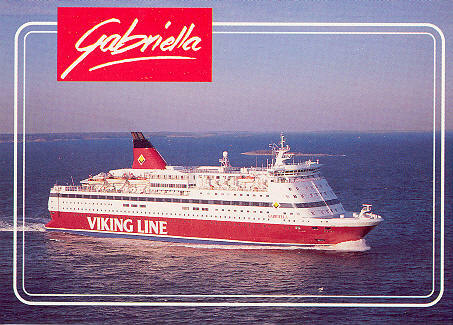 She was renamed Gabriella, entering service between Stockholm and Helsinki. She has subsequently served on other Viking Line routes. Frans Suell was built by Brodogradiliste Split, Croatia. 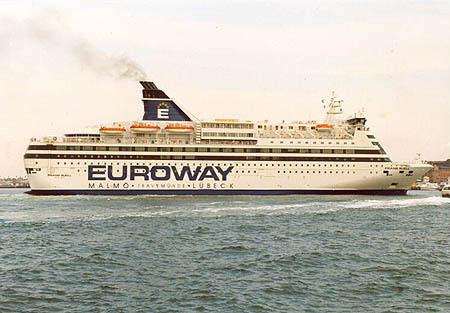 Frans Suell entered service in May 1992 on the Euroway service between Malmö-Travemünde/Lübeck. 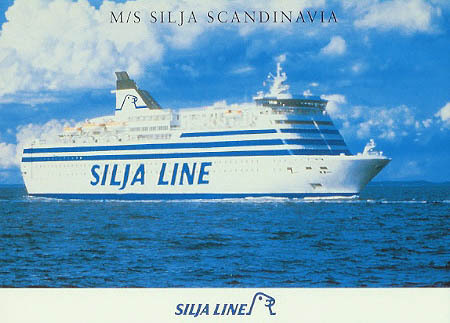 In 1993, the route changed to Copenhagen-Malmö-Travemünde-Lübeck, and marketing was undertaken by Silja Line, who provided their Silja Festival to run in partnership. 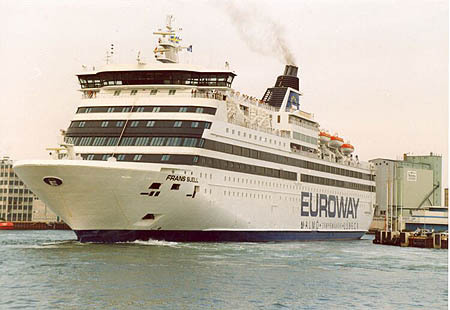 The Euroway service was closed in March 1994, and Frans Suell was chartered to Silja Line for service between Stockholm-Mariehamn-Turku/Åbo as the Silja Scandinavia. 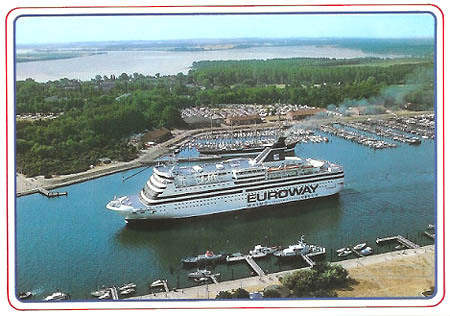 Euroway postcard of Frans Suell' issued before completion. 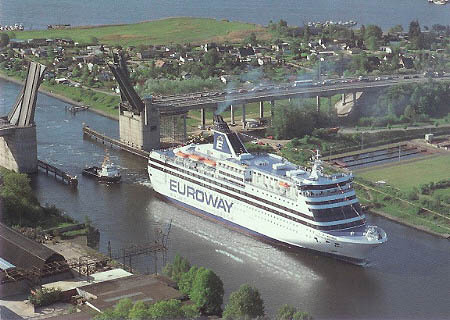 Euroway postcard of Frans Suell. Chantry Classics CC/S217 of Frans Suell. Simplon Postcards sp1124 (issued December 1992) of Frans Suell at Travemünde. S+S postcard Tra1602 of Frans Suell at Travemünde. 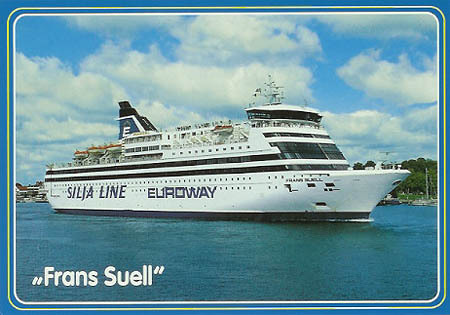 S+S postcard Tra1651 of Frans Suell in Silja Line Euroway colours. 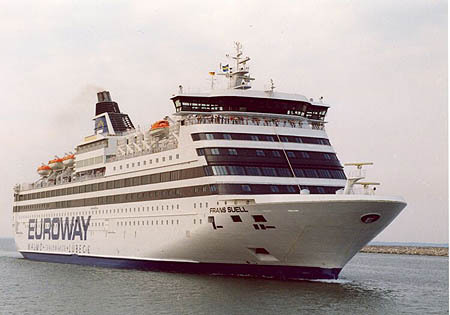 The Euroway service was closed in March 1994, and Frans Suell was chartered to Silja Line for service between Stockholm-Mariehamn-Turku/Åbo as the Silja Scandinavia. 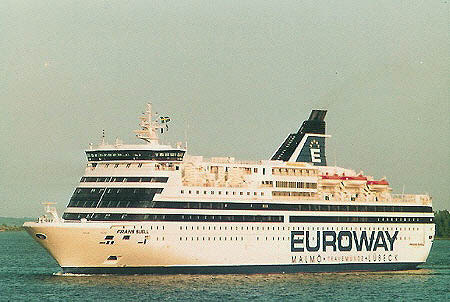 In 1996, Silja Scandinavia was sold to Viking Line for delivery in April 1997. 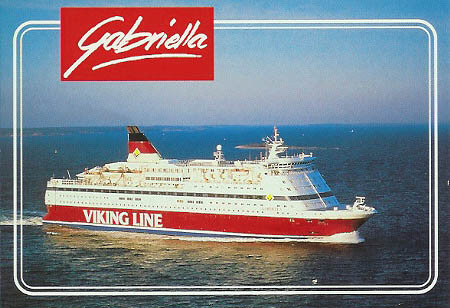 She was renamed Gabriella, entering service between Stockholm and Helsinki. 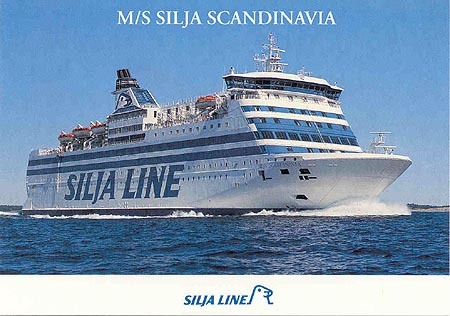 Silja Line (Effjohn International) postcard of Silja Scandinavia. Silja Line postcard of Silja Scandinavia. 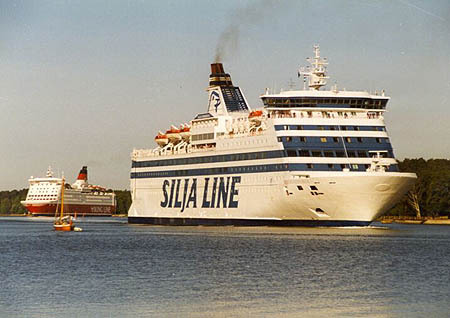 In 1996, Silja Scandinavia was sold to Viking Line for delivery in April 1997, joining sisterships Amorella and Isabella. 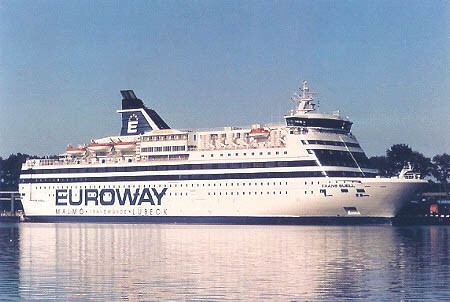 She was renamed Gabriella, entering service between Stockholm and Helsinki. She has subsequently served on other Viking Line routes. 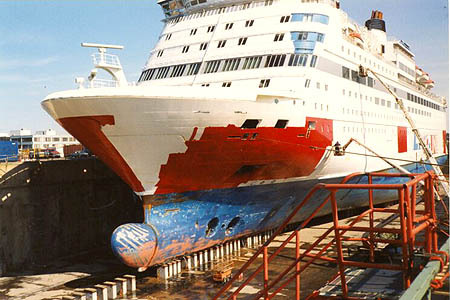 Photograph of Gabriella being repainted in Viking Line colours. 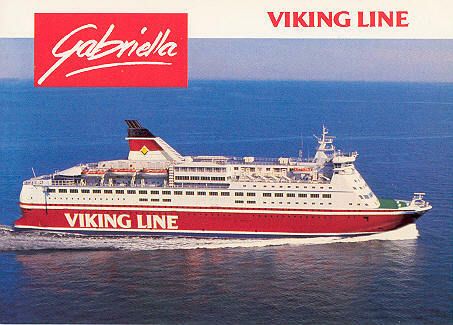 Official Viking Line postcard of Gabriella, still sporting funnel "embellishment". 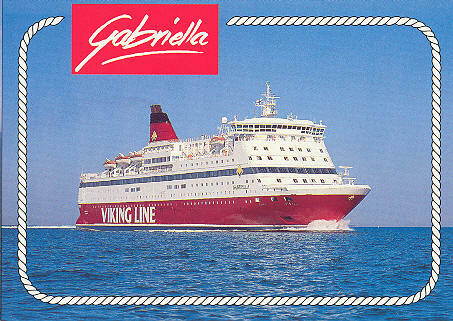 Official Viking Line postcard of Gabriella, with modified funnel in red/white. 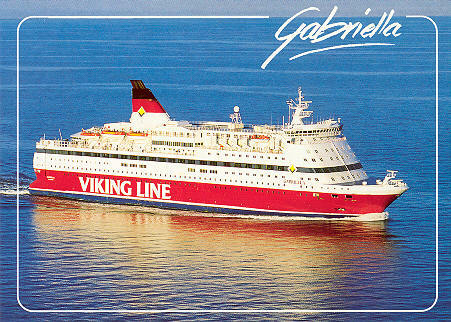 Official Viking Line postcard of Gabriella. The same card and serial numer as above, but with all-red funnel.